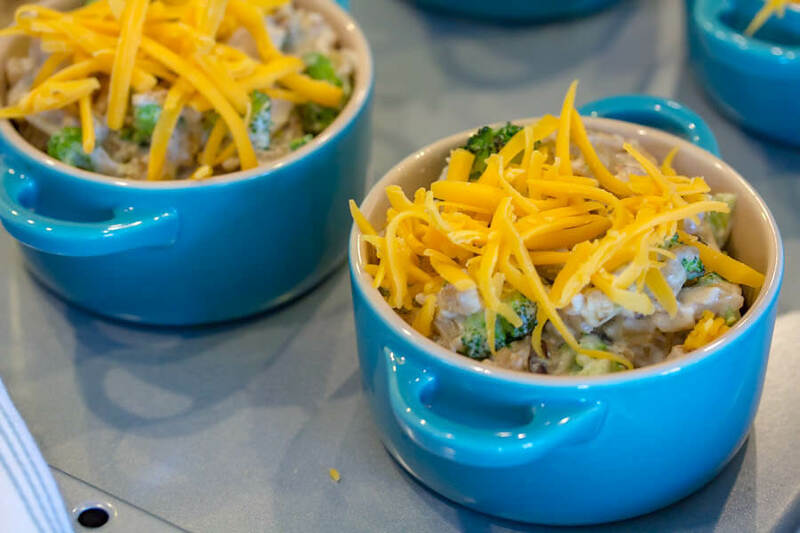 Use cooked turkey and quick-cook rice to make Individual Turkey and Rice Casseroles in less than 20 minutes for a fast, easy, and nutritious family meal. Having two “selective” eaters in my house under the age of 6 has forced me to get a bit more creative with our family meals in an effort to work in healthy sources of protein and more vegetables. 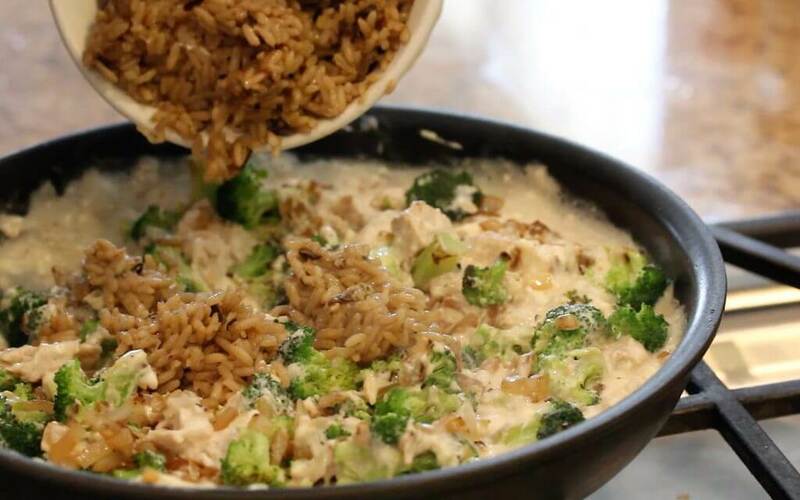 I created this recipe knowing that if I combined their favorites–turkey, rice, and cheese that I could add some broccoli and onions and hope for the best. The result: a success! Plus, the girls went bananas over having their own personal little casseroles. 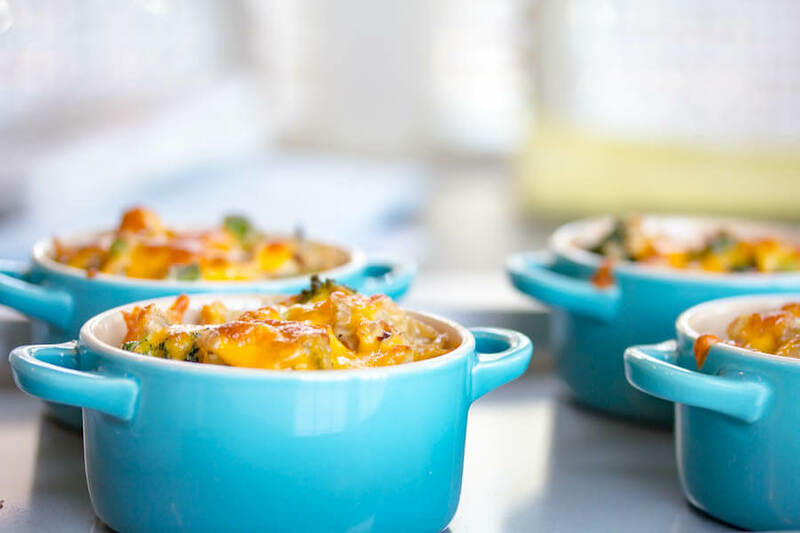 One of my favorite things about these little casserole cups is that they can easily be added into a weeknight rotation using leftovers or ingredients you have on-hand. For example, I made a variation of this One Pan Honey Roasted Turkey and Vegetables from Katie’s Cucina the other night (PS–my version of this recipe coming soon!) and had some leftover turkey so I used it the following evening to make my casserole cups. What’s also great is that if you don’t have leftovers you can buy precooked turkey breast strips or chopped cooked turkey breast in the refrigerated section of the grocery store (they are usually near the deli meats). 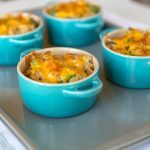 I used the precooked turkey breast strips (and chopped myself) when making the casseroles you see in these pictures and I’m happy to report that they were gobbled up (ha…gobble gobble) and the girls were eyeing my bowl for more. How to make: 20 minutes or less! Start by sautéing you veggies. This is where you can get creative and customize according to what you have on-hand. I think grated carrot, mushrooms, chopped squash or cauliflower could also work. 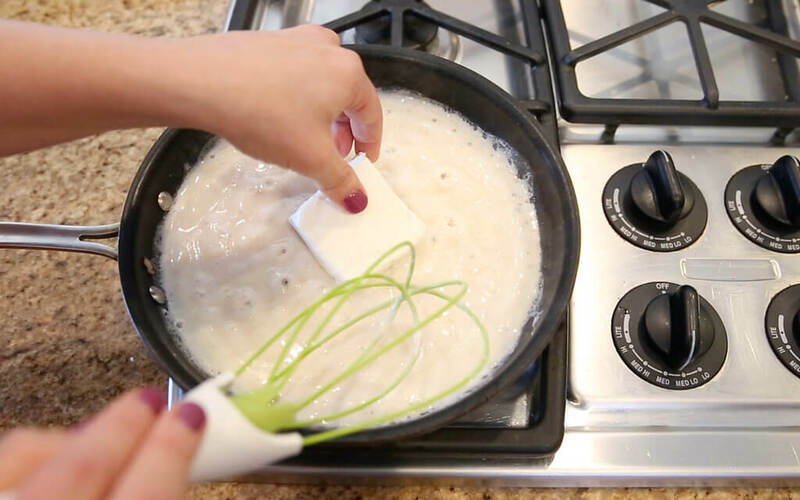 Melt cream cheese into the thickened milk to make your cheese sauce. No “cream of…” here! You can use either 1/3-less fat cream cheese or full fat for the recipe. Just stay way from the fat free because it doesn’t melt as well and give a “wangy” taste. 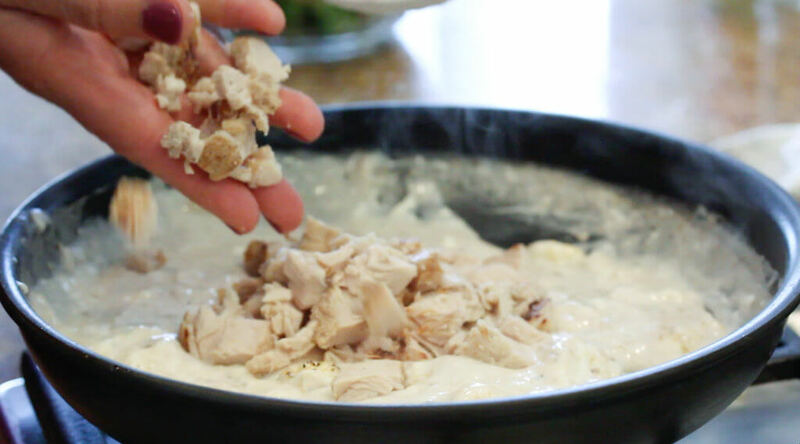 Add cooked turkey to the cheese sauce and stir until coated. 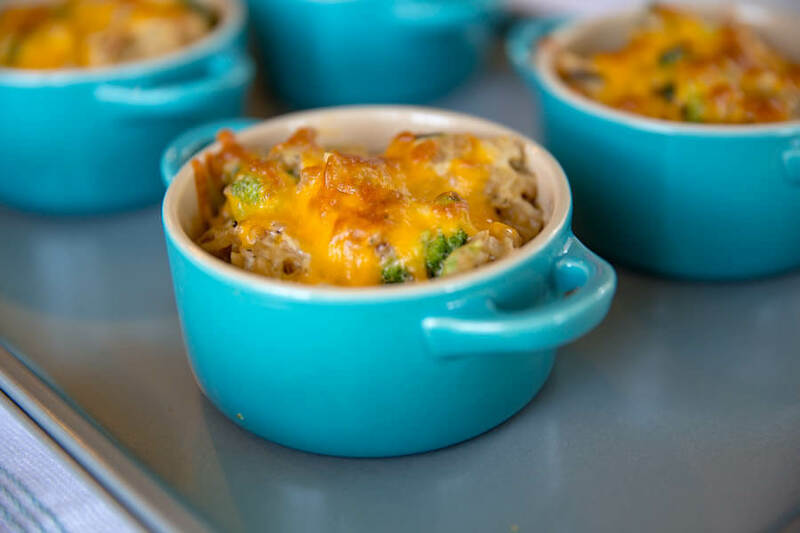 Turkey is a favorite for these little casseroles because its versatility allows it to pair well with the flavors in the cheese sauce as well as with the broccoli and rice. 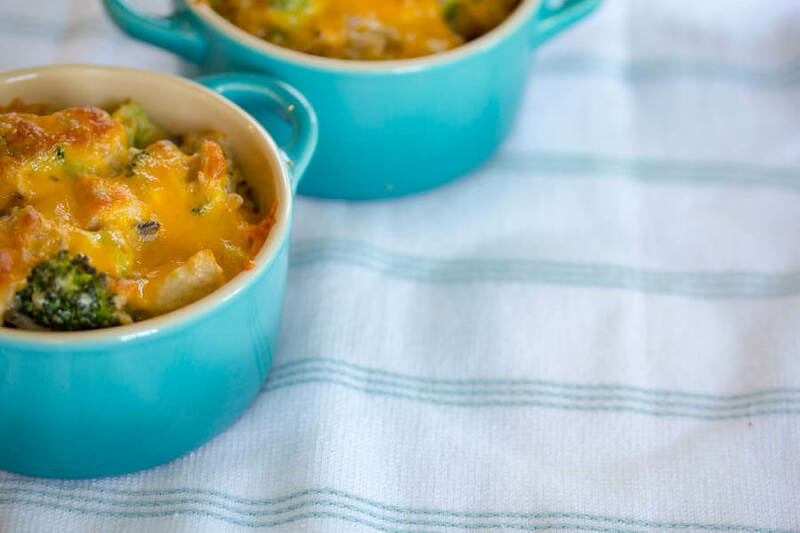 Plus, my girls love how tender and juicy it is in this casserole it gives them just the “right-size bite” (as Frances would say). As a mom with low iron to an anemic child, the fact that it is an iron-rich protein option makes it a star for me. This is also why I’m so pumped to be partnering with the National Turkey Federation to create this family-friendly turkey recipe for you! 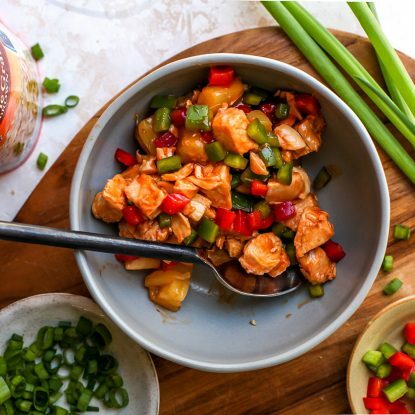 PS: If you love turkey like we do and want more recipes, make sure to check out the hashtag #tryturkey on Twitter and Instagram to see creative recipes from other NTF Ambassadors. 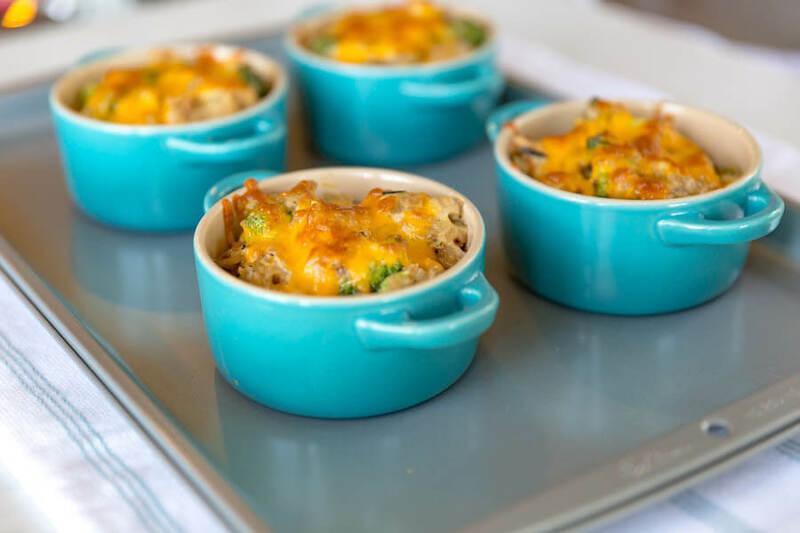 Top each individual ramekin with shredded cheese. I like shredding my own cheese because I think it melts SO MUCH BETTER you can also use pre shredded. Go for the full fat or reduced fat and skip fat free. If you don’t have ramekins, add the entire turkey mixture to a small baking dish and top with cheese. Pin the image below so you’ll always have Individual Turkey and Rice Casseroles recipe on hand. In a large skillet heat olive oil over medium-high heat. 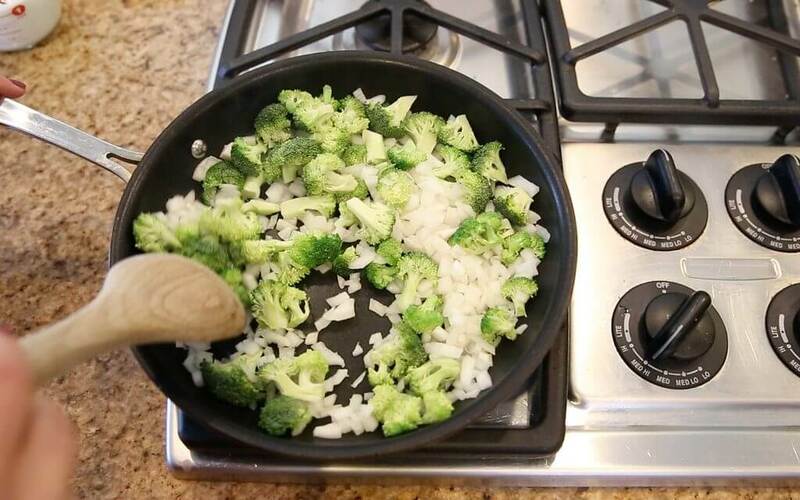 Add broccoli and onions. Cook for 5 minutes or until softened. Remove from pan and keep aside. While vegetables cook, prepare rice according to directions on the pack. Reduce heat to low and in the same skillet add milk and flour. 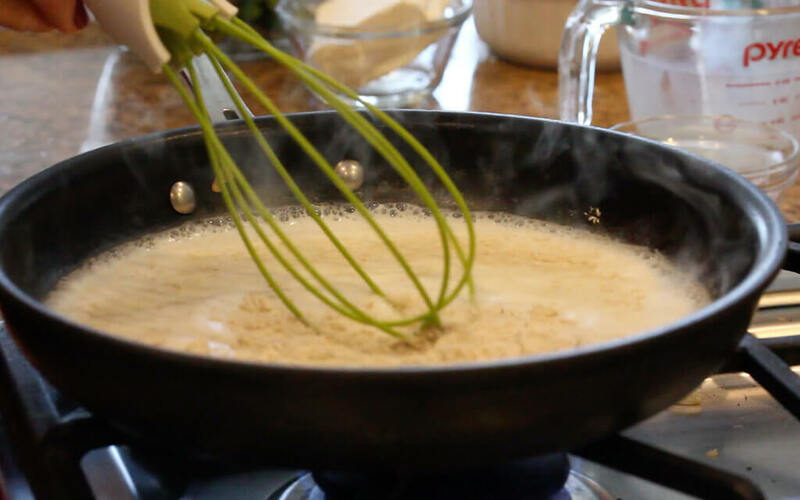 Whisk continuously until flour dissolves and mixture begins to thicken. Should be done in about 1 minute. Add cream cheese and cook 3 minutes or until cream cheese is melted. Stir constantly. Add garlic powder, salt, and pepper. Stir. 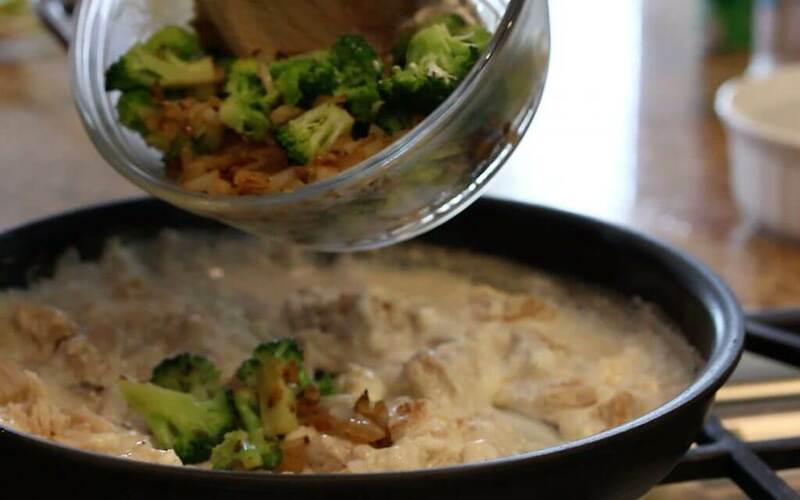 Add turkey, vegetable mixture, and rice to cheese sauce. Stir until well coated. Divide mixture evenly into 4 (1-cup) ovenproof ramekins. Sprinkle each with 1 Tbsp Cheddar cheese and bake at 375°F for 5 minutes or until cheese is melted. Serve immediately. 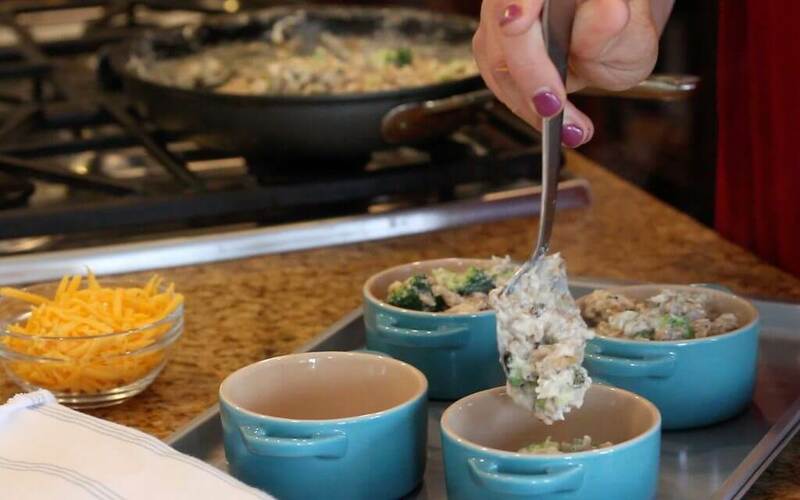 Use leftover turkey and quick cook rice to make Individual Turkey and Rice Casseroles in less than 20 minutes. They're fast, easy, nutritious and sure to become a family favorite. Holley, These look fantastic! Love how everyone gets their own little pot! Pinned to try soon! Thanks, Marisa! The girls thought that was very fun to have their own fancy bowl! Yes, let me know how you like it when you try it! These look so cute and delicious! My family would love this recipe, and the individual sizes make it so fun to eat, too! Let me know if you try it with them, Brittany. Thanks! WOW! I’m loving this recipe. What a yummy dinner idea. Thanks, Kristina! Plus, it is EASY! You can’t beat that! Thank you, Danielle! This is definitely a grown up version–no more canned cream of. I agree though. It was a favorite of mine as a child. Love these! They would be perfect to make for a family on the go! Yes! They reheat well too! First off, how cute are those ramekins?! Second, I’m loving this healthier spin on a classic comfort food.. I have a feeling it would be a crowd-pleaser! It was in our house! I like that they are portion controlled because I could literally eat the entire recipe! 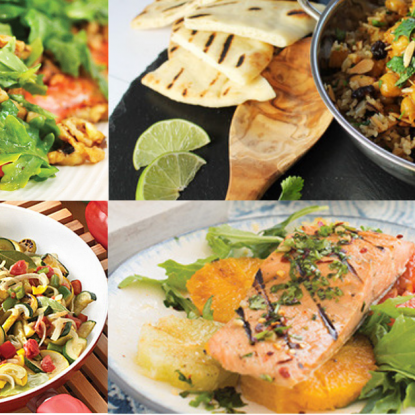 Love quick and easy meals like this! Can’t wait to try these next week for supper. This is a GREAT idea!!! I definitely want to try these!! These look delicious! Adding this on my list for next week! Thank you, Sara! Let me know if you give them a try! These look awesome – I particularly like your description of the taste of fat free cream cheese! Ha! “Wangy!” Thanks for reading! These are adorable! I have got to get some of these ramekins!! Do you cook the rice before adding to sauce? Yes. I cook it in the microwave. Yum! These look great, thanks for sharing! Yes, please eat this anyways–they are so good! Certainly eat turkey solo too for additional iron. 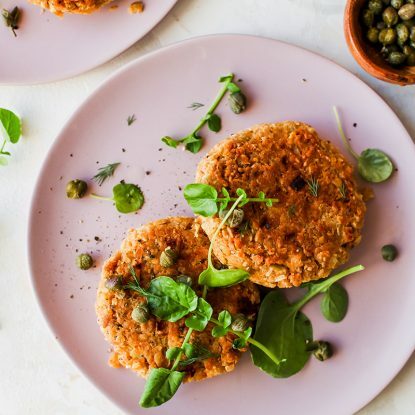 I don’t know the specific amount of iron that may be hindered by the dairy in this recipe but this recipe is so worth it!